A winning design from an invited competition for a complex of office and hi-tech users located at the Airport city adjacent to Ben-Gurion International Airport. 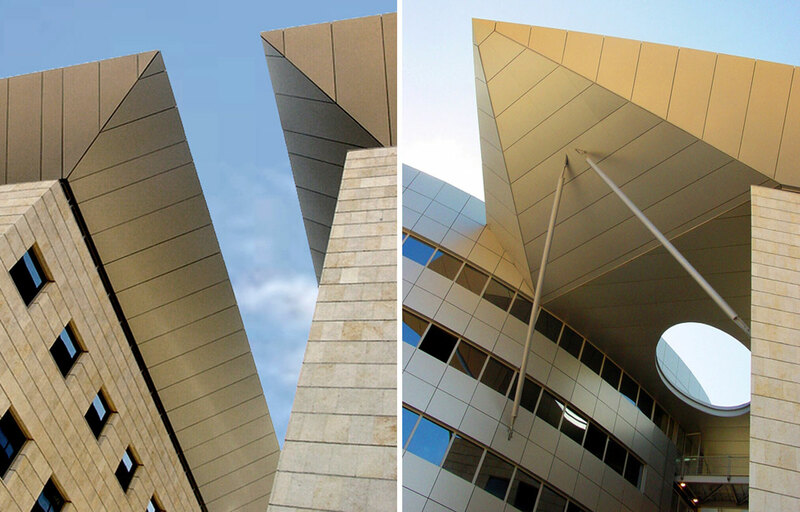 The building was divided into four wings which allows for the possibility of marketing each unit to a separate user. The total area available is approx. 15,000 sq.m. Each wing is 5-6 stories high and they are all interconnected with bridges and a flying aluminum roof. A winning design from an invited competition for a complex of office and hi-tech users located at the Airport city adjacent to Ben-Gurion International Airport. The building was divided into four wings which allows for the possibility of marketing each unit to a separate user. The total area available is approx. 15,000 sq.m. Each wing is 5-6 stories high and they are all interconnected with bridges and a flying aluminum roof. A winning design from an invited competition for a complex of office and hi-tech users located at the Airport city adjacent to Ben-Gurion International Airport. The building was divided into four wings which allows for the possibility of marketing each unit to a separate user. The total area available is approx. 15,000 sq.m. Each wing is 5-6 stories high and they are all interconnected with bridges and a flying aluminum roof.